Spray the crock pot with cooking spray. 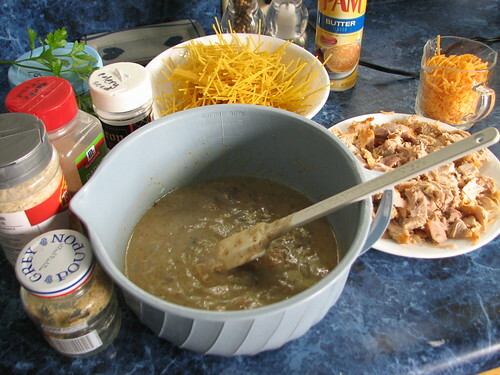 In a bowl, mix together the broth, soup, and mustard. 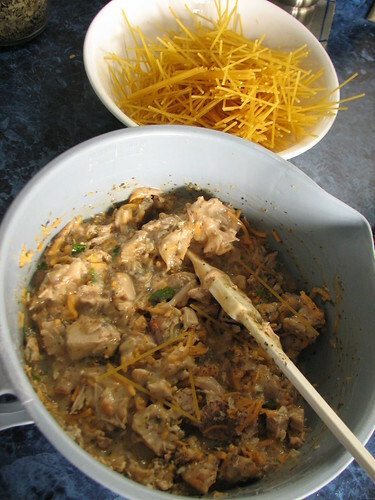 Stir in the remaining ingredients, except spaghetti. Add broken spaghetti. Stir to combine and pour into crock pot. Cook on low for 3 hours. 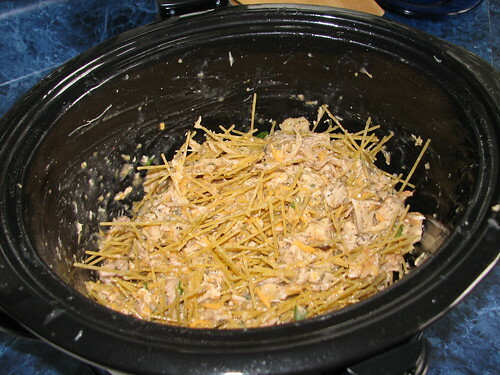 I started with the recipe Easy Crockpot Turkey Tetrazinni. After I took a look at it, I changed it quite a bit. I substituted chicken broth for water. I added more spices and left out the mushrooms and the pimento. Canned mushrooms are just plain yucky and we don’t like pimentos. If fresh mushrooms were on hand, I would have sauteed some of those and added them to the mix. I used one can of cream of mushroom soup and one can of cream of chicken. It was delicious. DH and I liked it. DD didn’t. But that didn’t surprise me. 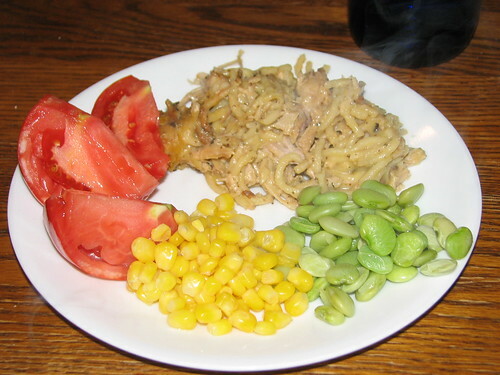 It’s easy to make and would be a good dish to take to a church dinner or potluck. I’d double it for a crowd and would probably add an hour of cook time for a double recipe. 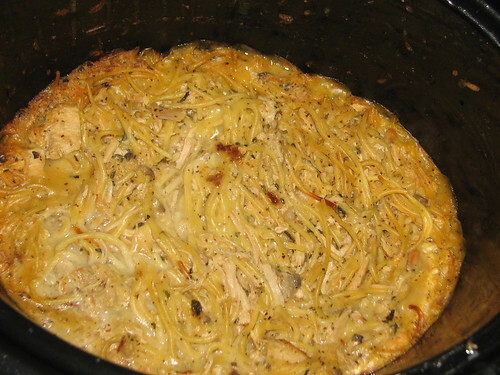 This entry was written by ~~Rhonda, posted on September 12, 2008 at 5:13 pm, filed under Recipes and tagged crock pot turkey tetrazinni, recipe. Bookmark the permalink. Follow any comments here with the RSS feed for this post. Post a comment or leave a trackback: Trackback URL. Just made this, it is a keeper at our house. YUMMY!! I dont have dijon mustard…do you think you could use yellow mustard in place?or is there something else to use? Hilary, regular mustard would be fine. But, if you have dry mustard, here’s a recipe for a Dijon mustard substitute. 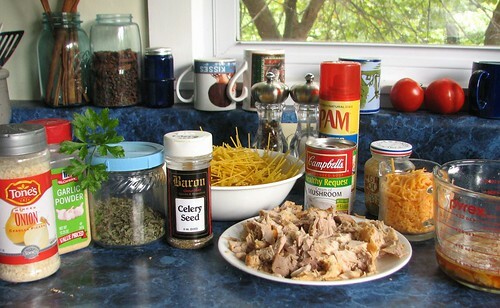 There seems to be an ingredient missing ….after the basil, and before adding spaghetti.